Hit by a timber jinker while directing traffic at a railway crossing. His son, Ian Stephen PRATT ( son ) died on 7 July 1949, aged 4 years and is buried with his father. Alma Charlotte PRATT ( wife ) died on 26 February 1959, aged 49, and is buried in the same plot also. 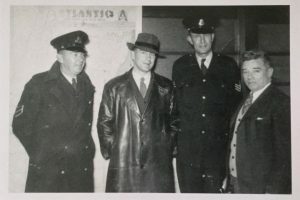 Senior Constable Neville Higgs, Detective Constable Terry Dudeney, Sergeant Edwin Pratt & ?. The three Police Officers were involved in numerous rescues/incidents in the Blue Mountains. 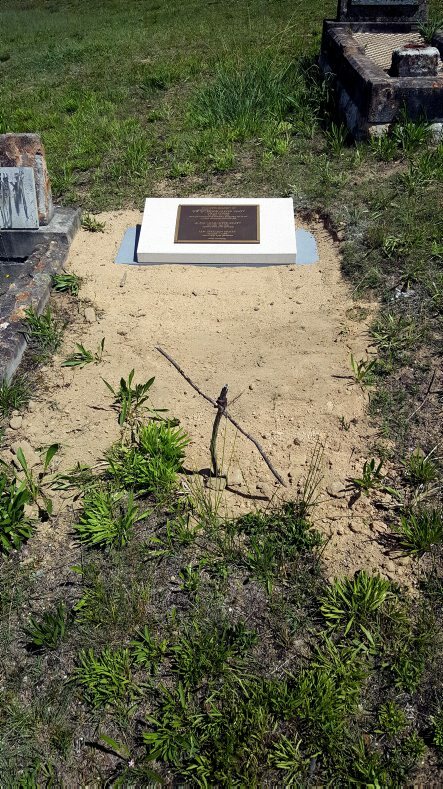 In early 2017, thanks to the efforts of Ian COLLESS, NSWPF, Edwin’s grave went from an unmarked grave to having an appropriate headstone placed at the spot that Edwin, his wife and son now, forever, Rest In Peace. 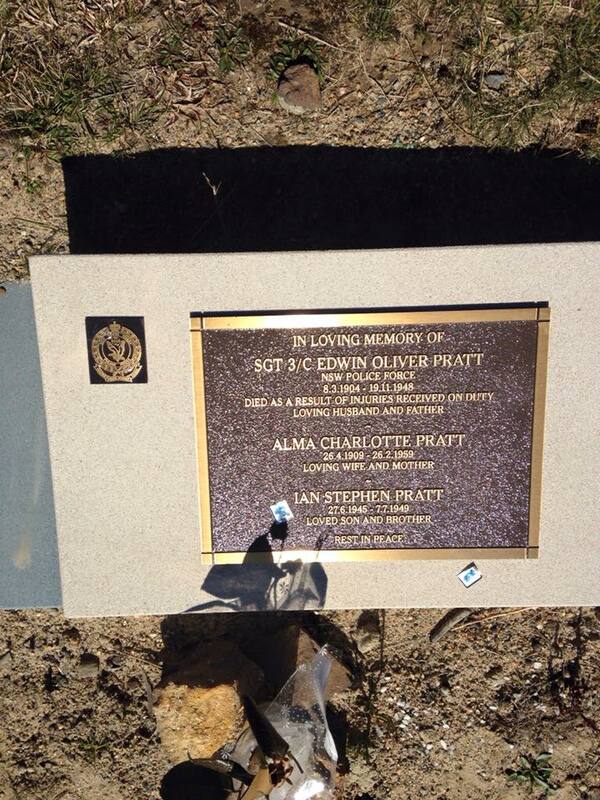 Just one more update on Sgt Pratt’s grave with a NSW Police crest added to the marker. My thanks to John McDiarmid and NSWPF Protocol for their assistance. Olwyn Danny Ken for your information. 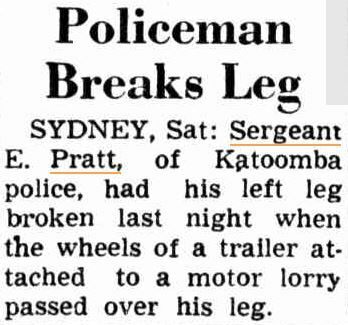 On the night of 1 October, 1948 Sergeant Pratt was directing traffic at a railway crossing at Katoomba. About 8.50pm a truck passed over the crossing and as it passed the sergeant attempted to walk behind it, not realising it was towing a timber jinker. Unfortunately the sergeant was hit by the jinker which inflicted severe injuries. He died on 19 November, 1948. He was survived by his wife Alma, sons Kevin and Ian, and daughter Olwyn. 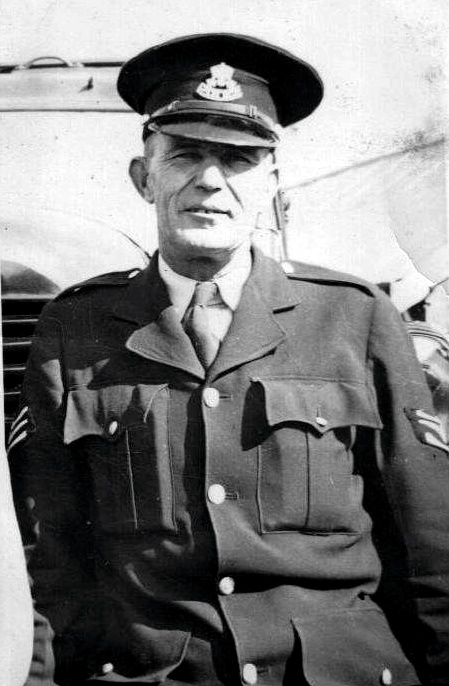 The sergeant was born in 1904 and joined the New South Wales Police Force on 14 May, 1924. At the time of his death he was stationed at Katoomba. On Thursday, 10 August 2017, the son-in-law – Retired Sgt 3rd Class Scott EDMONDS – married to Edwins daughter – Olwyn, passed away and was married to Olwyn for 51 years at the time. 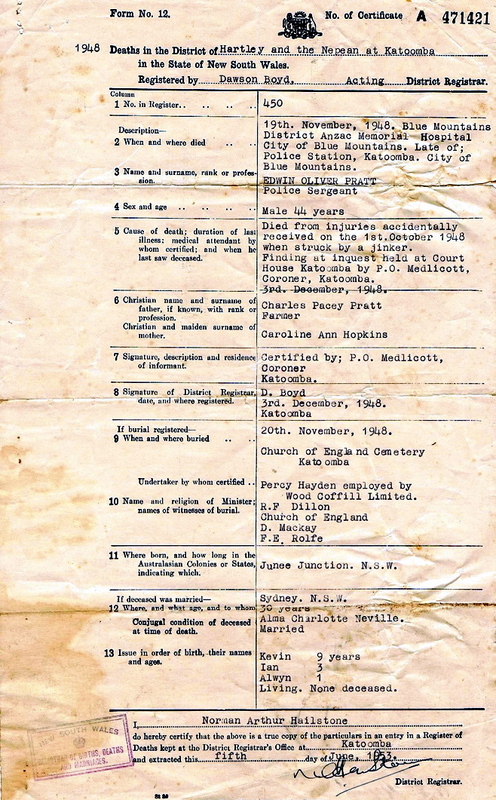 The death of Edwin has been widely circulated as having occurred on the 19 October 1948 which is INCORRECT and as of 30 October 2013, steps have been taken to have the correct date of 19 November 1948 recorded on all official touchstones and publications. As of 14 October 2016, having checked the online website of the National Police Memorial, the data on the website HAS been changed to reflect the correct date of death as NOVEMBER BUT, unfortunately, the actual Touch Plate has NOT been altered and still displays ( as of Police Remembrance Day 2016 ) the incorrect date. Unfortunately, the NSW Police Protocol Unit have done nothing to alter the Official website of http://www.police.nsw.gov.au/about_us/proud_traditions where the INCORRECT date is still reflected. I have, this date, sent a message to the Webmaster for NSWPF to action the website. Would have been nice if NSW Police Protocol Unit had let others know that they had actioned the matter in relation to the National Wall but I have now found out ( Friday 14 October 2016 ), that the actual Touch Plate on the National Wall of Remembrance has NOT been changed to reflect the correct date. BDM – Birth = 14621/1904 to Charles P. & Caroline A. Pratt at Narrandera. BDM – Death = 29635/1948. Charles Pacey PRATT & Caroline Ann PRATT. 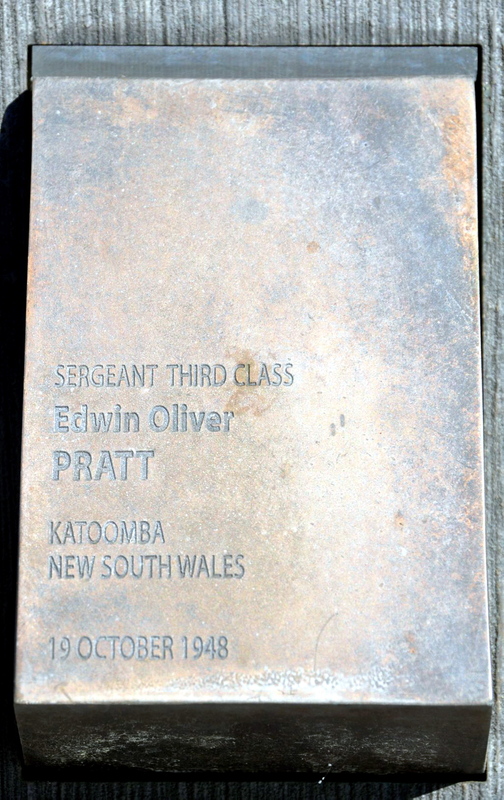 Edwin is buried at Katoomba Cemetery. Cemetery Rd, Katoomba, NSW. His son, Ian Stephen PRATT died on 7 July 1949, aged 4 years and is buried with his father. Alma Charlotte PRATT ( wife of Edwin ) died on 26 February 1959, aged 49, and is buried in the same plot also. Eucser Haze added 2 new photos. Today I remember all those that have gone before us, regardless of how they died or whether their name is recorded on a wall, or monument, or not. I specifically spare a thought for those that lay in unmarked graves throughout the state-we shouldn’t permit this to happen or continue. For that very reason a special thought for Sgt 3rd Class Pratt killed in 1948 whose grave is pictured below. Glen Kins As you say this should not be allowed to happen. Keith Smith Lest we forget. 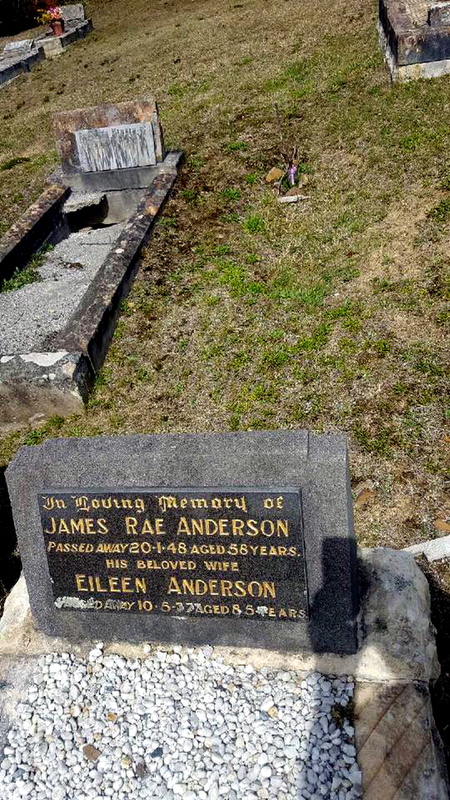 Olwyn Pratt Edmonds That tiny cross was placed there by his granddaughter Stephanie and her children during the last school holidays.,I have not been there since I was a child as I didn’t know where to find it till recent years. I went there as a teenager looking for a headstone, but as we now know , there wasn’t one to find. Only in recent years was I able to find the location. About unmarked police graves. I have been waiting for about 4 years for the Police Department to erect a headstone for my father Sgt 3/c Edwin Oliver Pratt. Promises promises. Last time I heard months ago that they were in the process of getting quote from stone mason for a full grave marker., but nothing since. The officer in charge is a very busy man indeed, so I do try to understand the delay. Would like to see it done in my lifetime. Greg Callander Did you check the PM that another member sent to you recently. It should be in your Others folder under messages about money towards the gravestone. Got the letter from Bathurst Council today approving use of Sulman Park and fees waived. Robbo has collected some prizes from local businesses for raffles etc. Robbo, Marita and I also met an interesting character at Sofala today – Robbo has a new bff. Ask him about it on the 30th. Danny Webster I hope to be there! 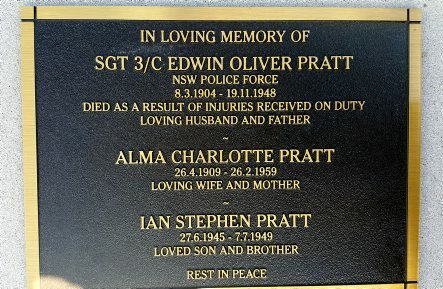 Remembering father Sgt 3/c Edwin Oliver Pratt on Police Remembrance Day. Greg Callander That is cool Rod Pratt. I was contacted, a year or two ago, by Olwyn Pratt ( https://www.facebook.com/olwyn.prattedmonds?fref=ts ) who is the daughter of Ed. I would assume that she will have more information on Ed and, maybe, your father. It is certainly worth contacting her. Olwyn isn’t a member of this particular FB Group but is a member of NSW Fallen Police FB Group. I tried to ‘tag’ her to this message but, because she isn’t on this page, wasn’t able to. Greg Callander‎ to Do you remember Katoomba when? Jim Mitchell How the memories flood back. 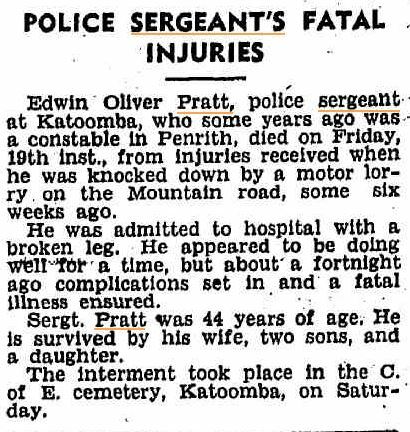 Dad attended the accident and that year I was in 4th class at Katoomba Primary with Sgt Pratt‘s son Kevin. 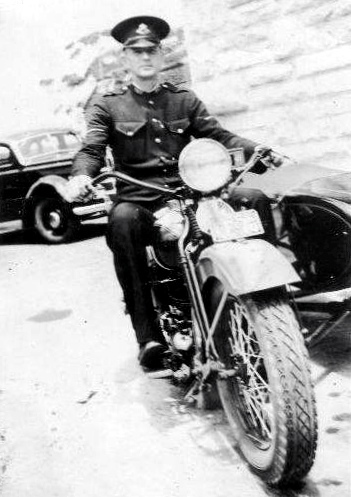 We love looking back on photos of the Police in a bygone era, check this amazing photo out of Sgt Edwin Pratt from 1930. 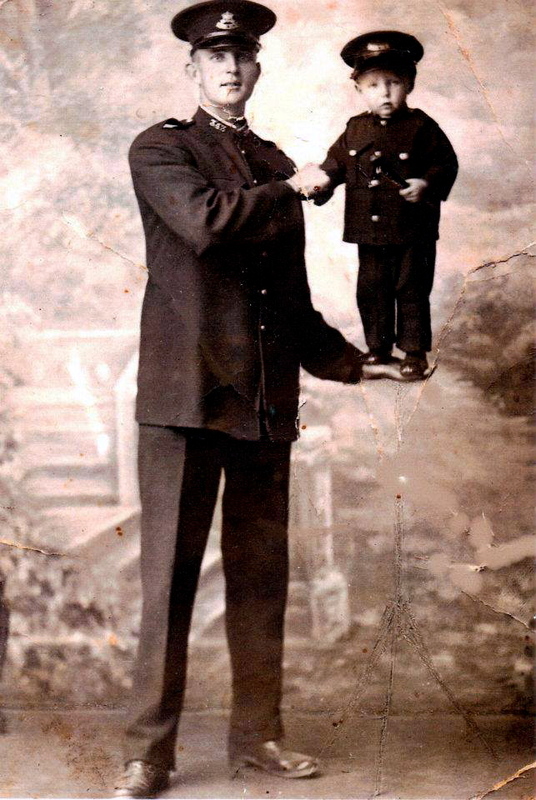 Memories of Penrith and surrounding suburbsLeanne Bailey posted this picture and this is her Grandmother being held wearing a miniature police uniform, brilliant photo! Liz RenshawAnymore info Leanne or anyone? A great picture . Susannah Low What a fab photo!!! The Honour Roll commemorates those members of the New South Wales Police Force who have paid the ultimate sacrifice in the execution of their duty. Leanne Bailey This happened at Katoomba. The only other story I know was that he had about 12 children, and sometimes would have a few of them balanced all over his bicycle in the afternoon, taking them for a ride down High street and to the river for a swim. Memories of Penrith and surrounding suburbs Leanne Bailey who is Sgt Pratt in your family tree? Jim Baldwin Samantha Jayne, in your family tree perhaps? The comment by Leanne Bailey makes it look like my father had 12 children which he didn’t.,and could anyone realistically carry 12 kids on a bicycle or even a motor bike and side car.???? I know this is an old post, but it is just plain silly.